What are inhibitions ? Its something which limits our action. Every person in this universe has got some or other inhibitions. These inhibitions comes in path of success and cause problems in the long run. We have to break this barrier and move ahead instead of sticking to it and crying over it. People start getting passive with their own personal inhibitions and lose confidence. Its this moment that we need to accumulate all courage and fight with this word. We all are aware of the proverb that success goes to those who strive hard for it. They don't wait for opportunity but create opportunities and achieve their goal. Whats the difference between people who are just speakers and those who grab every small opportunity and work with full devotion and determination, the difference is lots of people just speak and don't do it while those who do don't boast and are focused towards their goal. I have seen people waiting for the right day, right time and opportune moment to start a business or new work. Entrepreneurs life - Only Success and No Failures ! We all dream of a life without failures and only success. But do we get that ? 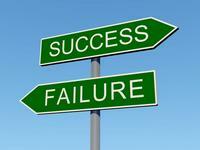 Is only success important and failures should be removed from dictionary ? Its very easy to fail than to succeed. We get “ F” on 6th position in the Alphabet series and “S” comes in 20th position. It means after failing one has to really work very hard to get success, travel the path difference of 12 alphabetical letters and get success. Then only we can enjoy the fruit of success. 1) Keep your head and your heart in the right direction and you shall never have to worry about your feet. so all forces are within you. 3) If your success is not on your own terms, if it looks good to the world but does not feel good in your heart, it is not success at all. 4) A successful marriage requires falling in love many times , always with the same person.